We are so close to finding out how who is going to win the Bully Wars, even though we all probably know who will win. That predictability is no issue for me though, because as long as this series is as entertaining as it has been so far, those things won’t matter to me. It feels similar to why I watch animated TV shows that I love. I pretty much usually knew how Gravity Falls episodes would pan out, but the wild ride that got me to that ending was amazing so I didn’t care. This series’ storytelling is as delightful as can be with characters that are funny, gross, caring, or terrible. It really is amazing how writer Skottie Young has made these characters feel like friends of my own with only four issues. We don’t see as much of Spencer as I thought that we would, but every little bit he is on a page, he is awesome. The character that we see the most of is Rufus, who I honestly felt like I loved even from the very beginning of this series. Sure, he was bullying these other hilarious characters, but every since we met him, Young created Rufus to immediately be likeable. Rufus' battle through this maze of a school is exciting to watch because I find myself eagerly rooting for him to make it through. Speaking of characters, this issue shows us more of Edith and Ernie than we are used to seeing. This was absolutely alright with me, because I find this duo to be one of the funniest parts of the series. This issue was no different for the pair as they deliver joke after joke while also completely coming through to save the day. 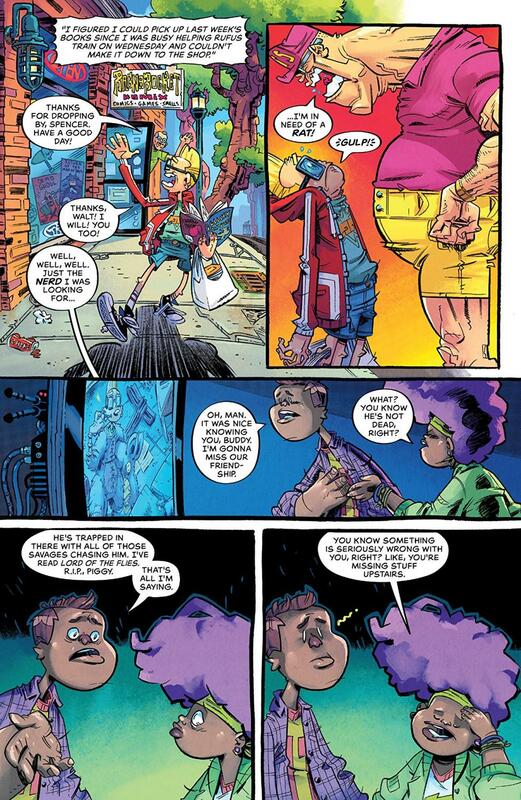 Every issue of Bully Wars so far has been amazing and weird, so I have been very excited to see the bizarreness that Skottie Young and Aaron Conley had in store for the old school that the Bully Wars takes place in. This was also not a disappointment as they have created a beautiful nightmare of a building in this school. One of my favorite things that artist Aaron Conley has done in this issue is the full page or full two pages of maze-like layouts that Rufus is making his way through. I know that I have said it before in a review of a previous issue, but Conley manages to make the artwork for this issue gross me out while also astonishing me with beauty. It doesn’t even make sense how this artist is able to achieve this strange phenomenon, but he did and it is very impressive. 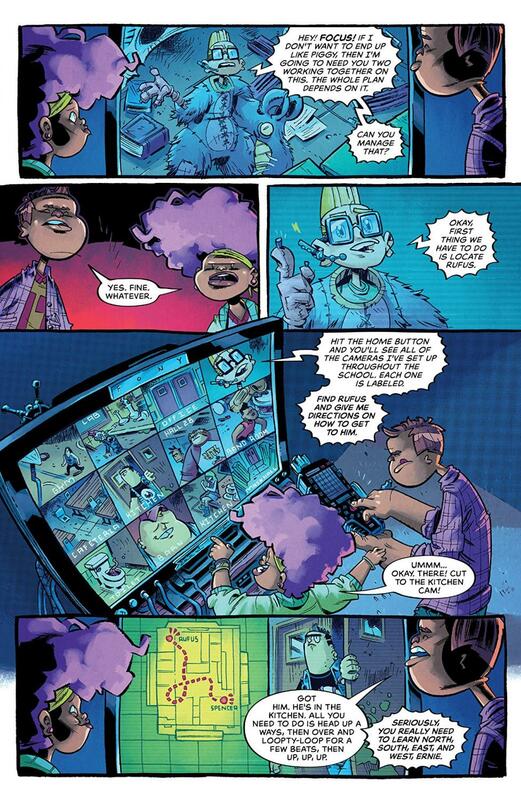 Skottie Young turns the speed up in this fourth issue with every single page being pretty packed with action. Another one of the amazing things about this series is how Young has created a story that is hilarious while also being interesting and exciting, and this issue probably shows that skill off the most. 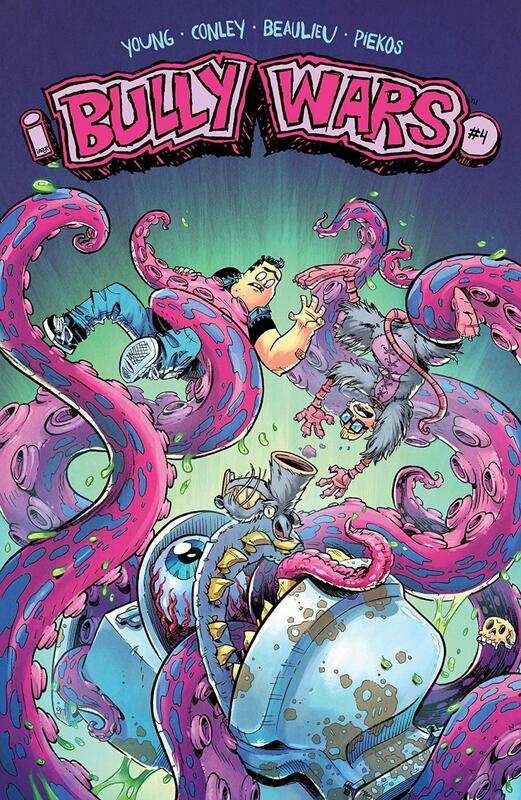 Bully Wars #4 is another lively and hysterical issue that will surely be just what anyone who has been keeping up with the series would have wanted from the actual Bully Wars event. Everything that was loved about the previous issues shines in this fourth issue making it one of the best of the series so far.